When you get the brochure for the M30, there are 2 pictures of the same convertible with the Front spoiler on. It was only speculation as nobody had ever seen a front lip on an M30 (either other owners or junkyard cars). I think the conversation eventually pointed to it being a prototype. At the back of the brochure, there is a section for optional accessories for the Infiniti M30. One of these options was a “Front Air Dam spoiler“. I have NEVER seen one until Shaun (Squid636) showed a picture of it. He also provided a part number (that was on the lip itself). It also had a “made in Austria” imprint on it as well. Ricky and I hopped over to the Infiniti dealership near Daly City. We asked a ton of questions about M30s and ask to look up the part number. Sure enough, it was for an M30 front air dam spoiler. BUT… they were out of stock. We relayed this info on the forums and I think everyone called their local dealerships asking about it and NOBODY had one. We debated about chipping in and getting one… but that didn’t materialized due to the dealership not giving us a definitive answer. I attempted to get one for myself at a later time and Infiniti told me it was discontinued…. In 2008, Dave (Driftur) had a front lip that Onevia (Renny) made a copy of. I believe it was a copy of a copy. Conclusion: It is interesting that these front lips were not plentiful on M30s. The fact that people have the gold package or car phone options (car phone being $899 additional)… I am surprised the lip wasn’t on more cars. 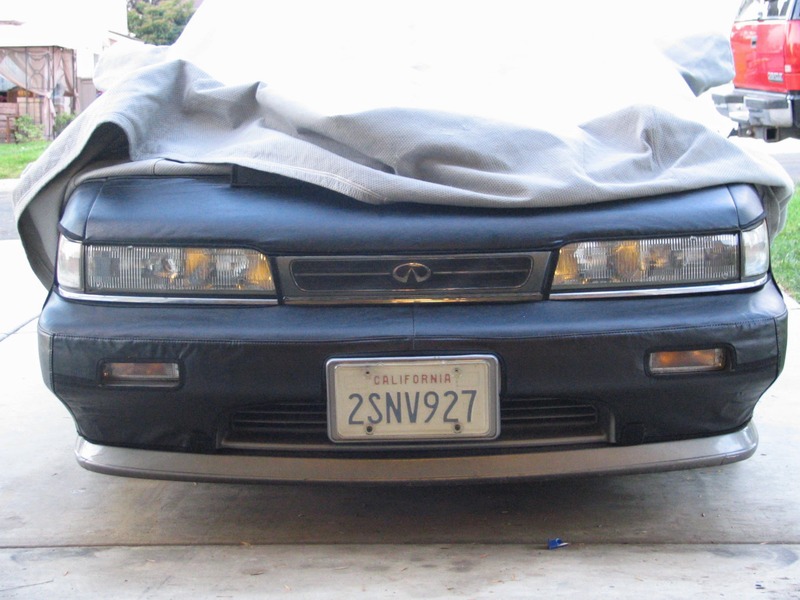 Besides these rare instances, it is interesting that Nissan did have these lips available for the Nissan Leopard. This entry was posted in history, opinion, parts, review.